Notes: At the start of WW2 a munitions factory was built just outside the village of Ruddington. The purpose of this factory was to produce 500lb and 1,000lb bombs for the Royal Air Force. Construction on the site began in December 1940 and by June 1942 production had begun. Ruddington was an ideal location as it had excellent rail links from Nottingham, Loughborough and Leicester and this would be vital in bringing in the large numbers of workers each day that would be required man the production processes. When the site was originally proposed it was planned that there would be around 6,000 workers on the site. Of this number 2,000 would live in a hostel, which was to be specifically built to house them. It was anticipated that a further 800 workers would find lodgings in and around Ruddington. This left the necessity of organizing transport to and from the site for around 3,000 workers. The factory was to be run 24 hours a day on a three-shift basis. By the time that production on the site did commence the proposed plans had been greatly modified. The proposed hostel for 2,000 people was never built. In fact accommodation was provided for only about 30 people on the site! However, approximately 200 buildings of various shapes and sizes were erected and roads, paths and rail link to Ruddington station with passenger platforms and a large loading bay. The station at the factory was called Ruddington Factory Halt and the service didn't appear in any timetables, it opened on 1st September 1941. Large 'blast banks' also needed to be constructed around the site in order to minimize the effects of any explosions that might occur as a result of accident or enemy action. A whole new sewage and drains system also needed to be constructed on the site. The actual cost for all this work doesn’t seem to be available anywhere but other sites constructed along the same lines tended to cost in the region of £3,000,000 to £5,000,000. Almost exclusively civilian workers staffed the factories, military personnel figured very little in the overall workforce. The person in overall charge of the site when it was in production was the Commandant, a title that smacks more of the axis forces than the allies. Amongst the first group of people to start work on the site were the security staff. They numbered about 36 personnel and operated around the clock. Everyone entering and leaving the site had to pass through a security gate and show his or her security passes. None of these security staff were armed, security of the site never seems to have been a major issue. The number of firemen employed on the site was approximately 72 personnel; double the number of security staff and it can be deduced that the threat of fire and explosion was considered to be far greater than breaches of security. The site also was not defended in any way, there were no anti-aircraft measures taken to protect the site. To locate and attack such relatively small sites in daylight was highly dangerous for the attacking aircrew and at night with the blackout the site was difficult to locate. The only danger from aerial attack would be from a stray bomb that had been aimed at Nottingham. That never happened, indeed during the whole of the war none of the ten munitions factories were ever hit by bombs. The running of these establishments was given, to what appeared on the face of it, some very strange bodies. The management of Ruddington was handled by the Co-op who were used to organising a large workforce with all that that entailed. Bomb-making production on the site lasted for less than three years. Workers had time off for the V/E Day celebrations and when they returned to the site afterwards it was to be told that production was ending immediately and that the site was closing. By V/J Day in August 1945 the site had been mothballed and being looked after by a skeleton staff. With the end of hostilities the Ministry of Defence found itself in possession of vast quantities of surplus war equipment from the armed forces. A means of disposing of this surplus was by auction and suitable locations to have such auctions were needed. Ruddington with its central location was deemed to be an ideal site for such auctions and so it was that in July 1946 the first of these sales took place. The amounts of vehicles that were involved was staggering. At that first auction some 800 trucks, 300 cars and 1,900 motorcycles were sold. Such was the success of that first auction that the stage was set for Ruddington to become the main location for future war surplus sales. 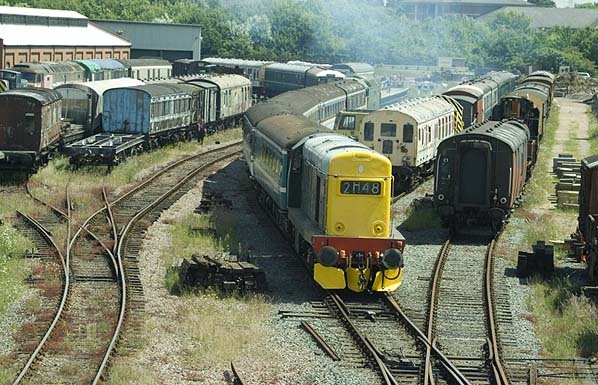 The depot became the Ruddington Ordnance Storage and Disposal Depot remaining in use until December 1983 when the auctions finally finished. The exact position of the station within the depot is unknown, is remained in use until some time after 1947. After decommissioning the site was bought by Nottinghamshire County Council and redeveloped as the Rushcliffe Country Park and within it the Nottingham Transport Heritage Centre. Too see other stations on the Great Central Railway between Sheffield Victoria and Aylesbury click on the station name: Aylesbury, Waddesdon, Quainton Road (1st site), Quainton Road (2nd site)**, Calvert, Finmere, Brackley Central, Helmdon, Culworth, Woodford Halse, Charwelton, Braunston & Willoughby, Rugby Central, Lutterworth, Ashby Magna, Whetstone, Leicester Central, Leicester North***, Belgrave & Birstall, Rothley**, Swithland****, Quorn & Woodhouse**, Loughborough Central**, East Leake, Rushcliffe Halt**, Ruddington, Arkwright Street, Nottingham Victoria, Carrington, New Basford, Bulwell Common, Bulwell Hall Halt, Hucknall Central, Annesley South Junction Halt, Hollinwell & Annesley, Kirkby Bentinck, Tibshelf Town, Pilsley, Heath, Staveley Central, Renishaw Central, Killamarsh Central, Beighton (1st site), Beighton (2nd site), Woodhouse Junction, Woodhouse*, Darnall*, Sheffield Victoria & Sheffield Bridgehouses. This post war OS map shows the depot and the railway network but not the station. It was probably sited to the right of the access road into the depot. The long building shown above this point is one of the few surviving buildings on the site today. The site of Ruddington Factory Halt was probably to the right of the building shown in this picture. This is the engine shed built by the Heritage Centre.